The kids are back to school. We’ve made it through summer vacations, family reunions and everyone’s favorite hair accessory: humidity. That’s right—fall is upon us! And to celebrate, we’re hosting our first ever Ladies Night at Amish Originals. Grab a friend and plan to join us on Thursday, September 19 from 7-9pm. 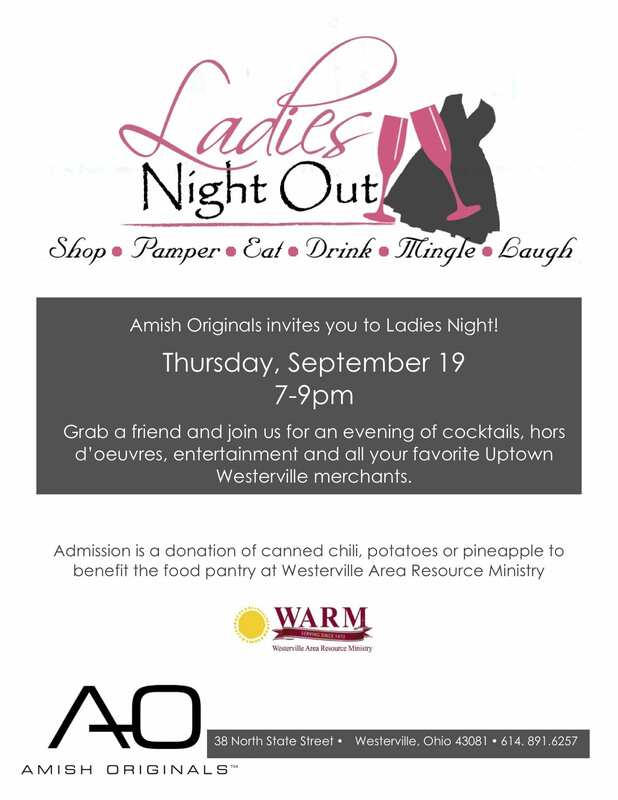 We’re hosting many of your favorite Uptown Westerville merchants and inviting everyone to come and enjoy time spent with friends along with hors d’oeuvres, wine and a signature cocktail for the evening. All we ask is that you bring a donation to the Westerville Area Resource Ministry Food Pantry; they have a specific need for canned chili, potatoes or chili, but will take anything that you are able to share with those in our community who need the support. or call the store at 614.891.6257. If RSVP-ing is not your thing, just come on over on Thursday, September 19th for the event; we’d love to have you!